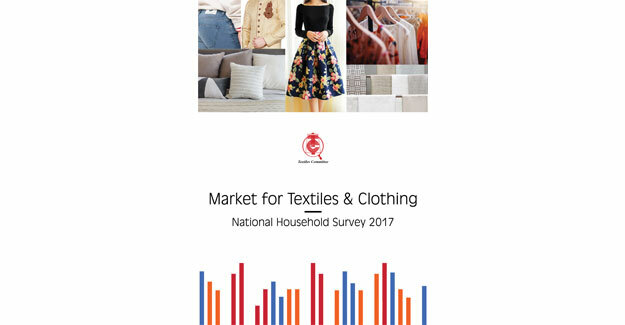 Textiles Committee, a Government of India undertaking, has published its much awaited research work ‘Market for Textiles & Clothing (MTC) 2017’ which is only such study in India based on primary data since 1969. The MTC report aims to evaluate the household demand for textiles and clothing (T&C) that accounts for around 53.4% of overall demand. The report defines the per capita and aggregate demand of T&C in the country by region, gender, area, income group etc. besides estimating the preference by fibre, product groups viz. woven knitted or home textiles etc. The study has found several key insights and Textile Excellence is pleased to bring the summery of the report for our readers as below. The overall market size of textiles and clothing including exports has increased from US$ 145.71 billion in 2015 to US$ 146.63 billion in 2016, which is expected to touch US$ 164 billion by 2018. Out of US$ 146.63 billion (in 2016), exports accounted for US$ 35.43 billion whereas household sector accounted for US$ 78.28 billion followed by US$ 32.91 billion of non-household sector. Thus, the household sector contributed 53.39% to the overall market size of the T&C demand. The aggregate demand for T&C was 41.06 billion metres in 2016 as compared to 38.54 billion metres in 2015 and showed an annual growth rate of 6.55%. 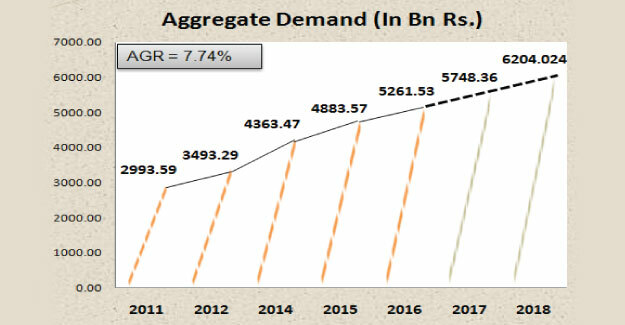 The demand is expected to touch 45.32 billion metres by 2018, growing at a CAGR of 5.34% between 2011-2018. In value terms, the demand has increased to Rs 5261.53 billion in 2016 as compared to Rs 4883.57 billion in 2015 & has witnessed an annual growth rate of 7.74%. 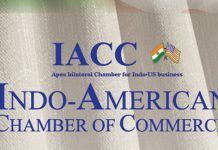 The demand is expected to touch Rs 6204.02 billion by 2018, with a CAGR of 9.54% between 2011-2018. The per capita demand for textiles was Rs 4081.60 in 2016 as compared to Rs 3836.13 in 2015 and has experienced a growth of 6.40%. 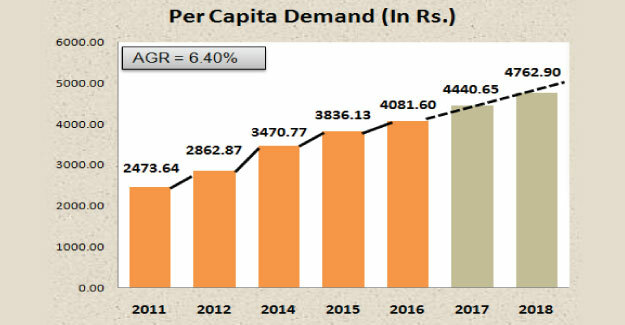 The per capita demand is expected to touch Rs 4762.90 by 2018, with a CAGR of 8.53% between 2011-2018. The per capita demand for textile in terms of quantity has touched to 31.85 metres in 2016 as against 30.27 metres recorded in 2015 with a growth of 5.23% during the period. 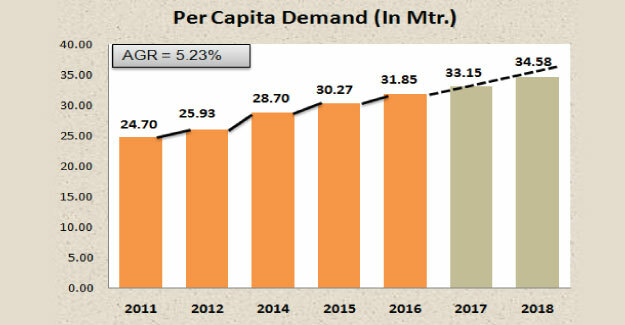 The per capita demand is expected to touch 34.58 metres by 2018, with a CAGR of 4.30% between 2011-2018. The per capita consumption of textile has increased by 1.58 metres during the period 2015-16. 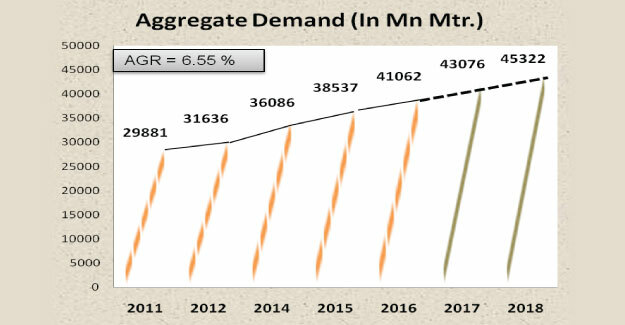 It is pertinent to mention that while the growth in demand was 6.91% in the urban area, rural area witnessed a growth of 6.01% during the same period. 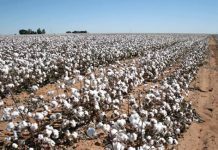 The aggregate demand forcotton fibre based product was 17.22 billion metres in 2016 as compared to 16.51 billion metres in 2015. The annual growth rate observed was 4.28% and aggregate demand is expected to touch 19.29 billion meters by 2018. The demand for manmade fibre based product was 23.34 billion metres in 2016 as against 21.60 billion metres in 2015 with a growth of 08.04% which is expected to touch 25.46 billion metres by 2018. 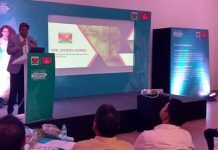 Similarly, the aggregate demand for pure silk and woolen fibre based product was 0.34 and 0.16 billion metres respectively in 2016 as against 0.27 and 0.15 billion metres in 2015, showing a positive growth of 25.18% and 8% respectively, which is expected to touch 0.37 and 0.20 billion metres respectively by 2018. 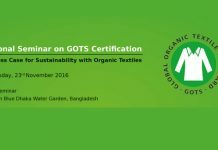 The survey reveals that out of the total aggregate consumption of 41.06 billion million metres (per capita 31.85 metres) of textiles in the year 2016, manmade and blended mixed textiles together have the largest share of 56.83% followed by cotton textiles with 41.94%, pure silk textiles with 0.84% and woolen textiles with 0.39%. 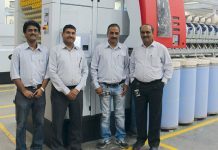 Hence, the demand for manmade fibre based products has been growing and contributing significantly to the overall demand in the household sector. The mill/powerloom sector has contributed 33.97 billion metres (82.72%) to the overall demand for textiles in 2016 compared to 31.85 billion metres in 2015 (82.65%). Similarly, the knitted sector has contributed 4.94 billion metres (12.04%) to the total basket in 2016 as against 4.77 billion metres (12.39%) in 2015. At the same time, the handloom sector contributed 5.24% to the total demand for textiles in the household sector. The aggregate demand for handloom textiles was 2.15 billion metres in 2016 as compared to 1.91 billion metres (4.96%) in 2015. The demand for handloom textiles has increased by 12.66% as compared to the previous year. 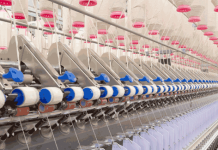 The projected aggregate demand for textiles by sector of manufacturing is estimated for mill made/powerloom, knitted & handloom sector to be 37.24 billion metres, 5.56 billion metres and 2.53 billion metres respectively for the year 2018. Some important varieties which are highly demanded in the household sector pertain to personal clothing and home textiles. Among the personal clothing’s, products like shirt, trousers, frock, skirt, jeans (male and female), sweater, saree, leggings constitutes the major varieties in the reference period. Similarly, the inner wears are also contributing significantly to the demand in this category. The MTC 2017 report indicates that the market size of personal clothing items was 37.87 billion metres during 2016 as against 35.52 billion metres in 2015 and has experienced a growth of 6.60% during the reference period. The market size of personal clothing items is expected to touch 39.64 billion metres during 2017 as against 41.66 billion metres in 2018 and experiencing a growth of 5.08% during this same period. As regards home textiles items, products like chaddar, bedsheets, towel and terry towels contributed significantly to this segment. In addition, products like cushion cover, furnishing materials, blankets have also increased their presence in the product basket. 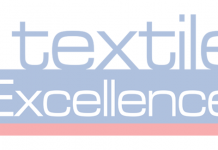 Readers who wish to access the findings of the MTC 2017 report may order a copy to Textiles Committee or contact: Textile Excellence.